Fiat re-created the looks of Abarth-tuned 124s from the 1970s for a performance version of its new roadster, a source said. TURIN -- A prototype of the Abarth performance version of Fiat's new 124 Spider was shown to guests at a special ceremony last month ahead of likely sales in 2017. A source at the event, held at Abarth's headquarters here, told Automotive News that the 124 Abarth taps into the same heritage that Fiat is channeling with the retro-looking 124 roadster, which was revealed last month at the Los Angeles Auto Show ahead of sales next year. 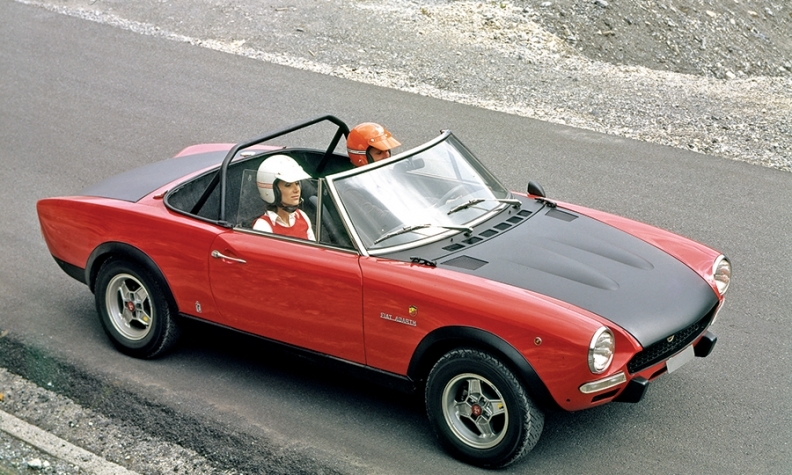 The original 124 two-seater launched in 1966 became a successful rally car in the early 1970s in the hands of Abarth, which also made road-going versions. For the prototype, Fiat re-created the looks of that car with details such as the contrasting black hood and lift-off hardtop, the source said. A more aggressive front bumper also punches up the looks of the 124, which is based on the Mazda MX-5 Miata and built in the same factory in Hiroshima, Japan. The Abarth version will use the same 1.4-liter turbocharged engine as the regular 124 but will receive a power bump from the 160-hp U.S version. The source said one version will make more than 200 hp to tie in with a possible return to world-level rallying. Outside the U.S, Abarth is a stand-alone brand offering the Fiat 500 in myriad formats, including a 190-hp two-seater called the 695 Biposto. Customers can spend up to 50,000 euros ($53,000) on the diminutive hot hatch, brand head Paolo Gagliardo told Automotive News. The brand's head of marketing, Fabrizio Simoni, said the company is also working on an Abarth version of the Fiat 500X subcompact crossover.